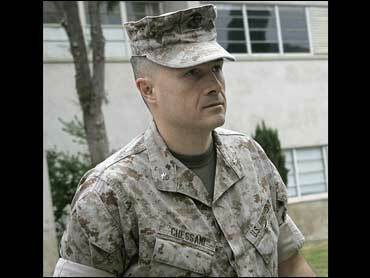 A military judge dismissed charges Tuesday against a Marine officer accused of failing to investigate the killings of 24 Iraqis. The charges were dismissed without prejudice, meaning they can be refiled, but Folsom barred Marine Forces Central Command from future involvement in the case. Of eight Marines originally charged in the case, only one is still facing prosecution in the biggest U.S. criminal prosecution involving Iraqi deaths to come out of the war. The incident occurred after a Marine was killed by a roadside bomb. Staff Sgt. Frank Wuterich, who faces voluntary manslaughter charges, and a squad member shot five men by a car at the scene. Investigators say Wuterich then ordered his men to clear several houses with grenades and gunfire, leaving women and children among the dead. to address the judge's initial finding that there was evidence of unlawful command influence in the case. Col. John Ewers, the military lawyer who investigated the killings and took Chessani's statement, later became a top legal adviser to Mattis and sat in on briefings that helped Mattis decide who would be charged. Mattis testified he never talked with Ewers about Haditha, although Ewers was present during a number of legal meetings where Haditha and Chessani were discussed. Military policy prohibits Ewers from offering legal advice because he also was an investigator in the case. Mattis approved the filing of charges against Chessani when he was both commander of the Marine Corps Forces Central Command and the commander of the 1st Marine Expeditionary Force at Camp Pendleton. He has since been promoted and serves as commander of both NATO's Supreme Allied Commander Transformation and commander of U.S. Joint Forces. Four enlisted Marines were originally charged with counts related to the killings and four officers were charged in connection with the investigation, including Chessani.